UN Commission on Status of Women passes only one political resolution - to blame Israel for wife-beating of Palestinian Arab women. 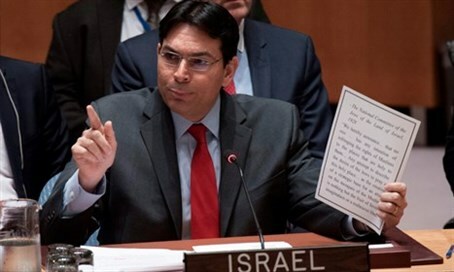 The Israeli mission to the United Nations, led by Danny Danon, has offered strong criticism for what it calls another example of the international body's hypocrisy against the world's only Jewish state. Thursday's issues revolve around the Commission on the Status of Women (CSW), which voted to blame Israel for Palestinian domestic violence. As has become routine in the United Nations, Israel alone was singled out for condemnation, while Syria, Iran, Venezuela and others were left alone. "The UN is obsessive and hypocritical when it comes to Israel," said Ambassador Danon, who presented the member-states with a report documenting the condition of women around the world. "Terrible atrocities are taking place across the globe and they are ignored because of political interests, which then worsens their plight." Danon's report showed that the Iranian legal system literally consider a woman's life to be worth only half that of a man's, that forced marriage and violence against women is legal in Syria, and that many Venezuelan women are prevented from accessing the criminal justice system. "Instead of adopting resolutions to assist women in Syria, Iran or Venezuela, the CSW will adopt a single resolution with only one purpose – defaming and demonizing Israel," Danon wrote. "This is pure hypocrisy." The CSW meets every year to discuss different ways to promote gender equality around the world. Israel always takes an active role in the Commission. Despite this, the only political resolution adopted in the CSW is the one that deals with Palestinian women, making in the most absurd manner, Israel the only country in the world condemned for its treatment of women. The rest of the resolutions adopted were not political in nature and are intended to empower women. Last year, the international organization approved a similar unique motion against Israel.